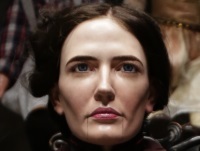 “Penny Dreadful”’s Victorian-era, English demon-huntress Vanessa Ives (Eva Green) was never big on dolls. During the show’s second season, she confessed she’d played with them as a child – because if you didn’t you were considered a deviant – but never liked them. “Those eyes, staring at you, just waiting to come to life,” she said, in a foreshadowing that literally exploded in last night’s life-and-death, girl-on-dollgirl Season 2 finale, “And They Were Enemies.” She was dead right about the eyes. Battling for Vanessa’s tormented soul, all but gnawed to shreds this season, is Evelyn (Helen McCrory), a/k/a Madame Kali, the agent and instrument of Satan who, as king of the Underworld, wants Vanessa for his own. One of this season’s stunning visual highlights has been Evelyn’s enchantment room where, over the centuries, she’s fabricated extraordinary doll-creatures. Embedded with human hair, animal organs and other vital substances, these puppets receive Evelyn’s spells which can wreck and destroy the minds and bodies of their human counterparts. Perched upon shelves and ceiling beams, the dolls bore witness – sometimes flashing horrified gasps and widening eyes – to the cunning and single-mindedness of their creatrix. Not surprisingly, the fabricated entities in the peanut gallery were not only decorative. They were part of the plot. In the early part of the finale, Evelyn orchestrates the face-to-face confrontation between the Devil’s mouthpiece Vanessa-Doll and the human Vanessa who refuses to surrender to Hades with a kiss. However, to engage in a battle with such prohibitive odds, Vanessa must go for broke, becoming – as had warned the witchy Cut-Wife (Patti Lupone) for whom Vanessa apprenticed – very much like Satan himself. The Vanessas’ spell-a-thon and incantations delivered at breakneck speed reach a crescendo that inevitably leads to a literal blow-out. Amidst this fierce confronation between God and the Devil for the human soul – Vanessa’s is obviously quite special – why should these dolls mesmerize the way they do, given how they pale beside the larger theme of good vs. evil? At the archetypal level, there’s the element of miniaturization. Dolls serve as companions for children, entities on whom the young can lavish their affection and fledgling nurturing skills. But, as smaller versions of the real thing, dolls symbolically hold the contents of whatever larger figure they represent. There’s potency in that contracted energy. But because this vitality is artificial, to see it come to life through unnatural means makes these dolls all the more creepy. 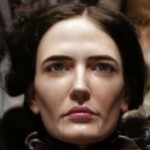 In Season 2, a good part of Evelyn’s handiwork had also been about doll-messing with one of Vanessa’s demon-fighting cohorts, father figure Sir Malcolm (Timothy Dalton), while she simultaneously clouded the paths of Vanessa’s other allies Ethan Chandler (Josh Harnett), Victor Frankenstein (Harry Treadaway), Ferdinand Lyle (Simon Russell Beale) and Sembene (Danny Sapani). 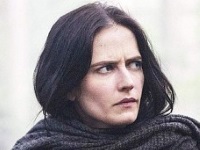 By the end of the finale, the surviving key players – including Frankenstein’s Creature Jon Carney (Rory Kinnear) – split for separate destinations, all serving, at least for the moment, different masters connected with their wounds, regrets, sins and penitence. 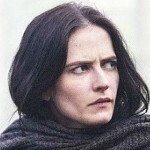 Which master Vanessa Ives now serves – she’s tossed a once beloved crucifix into a burning fire – remains to be seen. Astrology Archetype: Saturn, which rules contraction. Mercury, which, through Gemini, rules twinning.